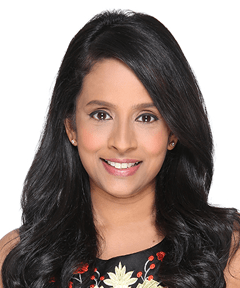 Dr Dharshini was born in the United Kingdom and educated in Singapore. She graduated from the Faculty of Medicine, National University of Singapore (NUS), with a Bachelor’s degree in Medicine and Surgery. She subsequently went on to obtain her Masters in Obstetrics and Gynaecology and became a Member of the Royal College of Obstetricians and Gynaecologists (United Kingdom). Dr Dharshini is experienced in antenatal ultrasound as well as performing natural childbirth, assisted delivery (vacuum and forceps) and caesarean sections. She has extensively trained in gynaecological surgery (hysterectomies, myomectomies, cystectomies), laparoscopic (key-hole) procedure and has a keen interest in hysteroscopic surgeries (a non-invasive procedure to surgically treat small masses within the womb). Dr Dharshini was a Clinical Teacher and Examiner with the Dept of Obstetrics and Gynaecology, NUS. She has conducted Clinical Skills workshops to train medical students and young doctors in Obstetrics management. She was made Chief Registrar in 2011 at the National University Hospital. An avid orator, Dr Dharshini regularly participates at local and international O&G conferences. She has presented her research works at international conferences in Greece, Beijing and Kuala Lumpur. She won the first prize for Oral Presentation at the SICOG (Singapore International Congress on Obstetrics and Gynaecology) in Aug 2011 for her paper on Encephalitis related to Ovarian Dermoid cysts. A pro-life advocate, she has also published research on the incidence of Chlamydia Trachomatis in post-abortion females in Singapore. A proud mother of three beautiful girls, Dr Dharshini knows of the immense joys that motherhood can bring and takes great pride in taking her patients through the wondrous journey of pregnancy and being a strong breastfeeding advocate and confidante thereafter. We are open during lunch hours for busy working women.